Looking for a low FODMAP appetizer to make the holidays a little easier? Try these low FODMAP lemon-caper potato bites! This cute little finger food is packed with flavour, but not with FODMAPs. 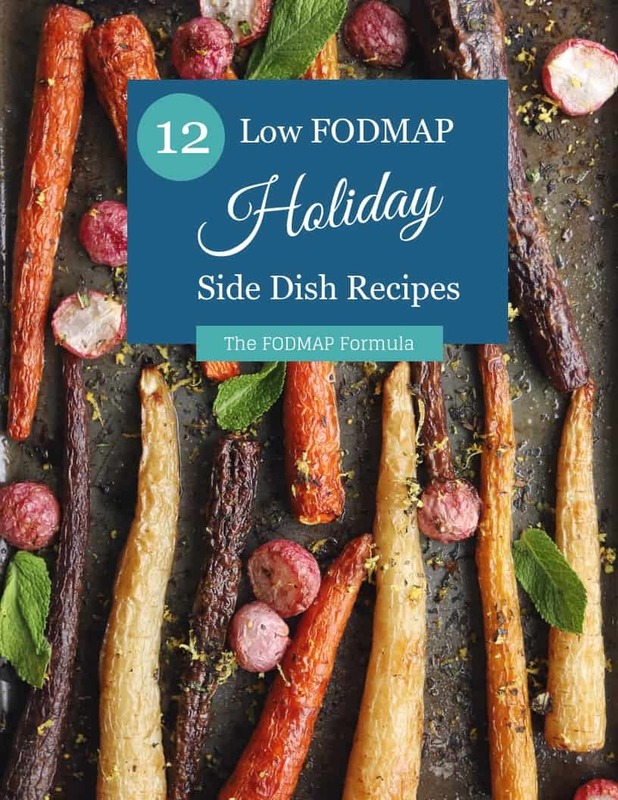 So, you can focus on your friends and family this holiday, instead of the Low FODMAP Diet! I’ve always been a little wary of recipes with capers. The first time I had them I was meeting friends of my husband’s family for the first time. They brought out this super fancy Ceaser salad and I panicked. I knew there were anchovies in a Ceaser salad, but I thought they’d be invisible, stealthy anchovies I could imagine weren’t there. I definitely mistook the capers for gigantic anchovy pieces and tried to quietly hide them under a lettuce leaf. My husband caught me and had a pretty good laugh about it. It took him most of the ride home to convince me they were capers – I’m still not 100% sure. Needless to say, capers and I got off to a rough start. But, this recipe has really helped bolster my opinion of them. They add a really fun pop to the flavour to these potato bites. So, I guess they’re growing on me. Side note. Try not to spill any of the vinegar on yourself. I was in a rush when I was taking the photos and I accidentally spilled most of the vinegar on my hands and pants. 17 showers later I swear I still smell like I’ve been pickled. That’s probably not how you want to spend your holiday! Think these low FODMAP lemon-caper bites sound great, but you don’t have time to try them now? Don’t worry! You can PIN THIS POST for later! 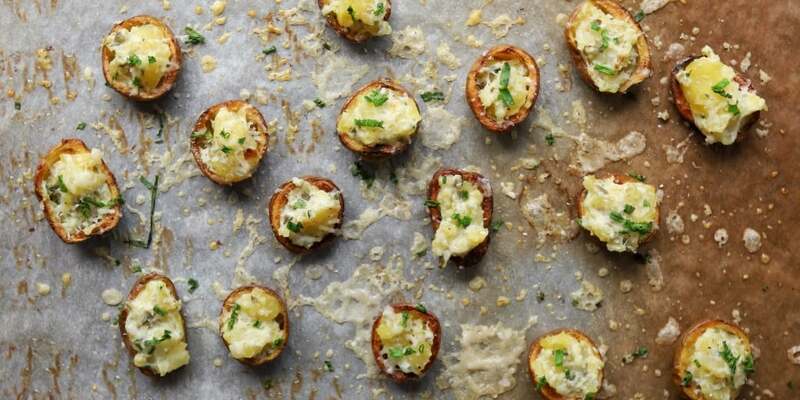 These low FODMAP lemon-caper potato bites are the perfect finger food for your next holiday bash. Check out the notes below for tips on keeping this recipe FODMAP friendly. First up, potatoes. According to the Monash app, potatoes don’t have any detectable FODMAPs. This means you can eat as many as you’d like without adding to your FODMAP load. Our next ingredient is sour cream. If you’re in the elimination phase of the Low FODMAP Diet, you’ll need to use a lactose-free sour cream. For my Canadian peeps, both President’s Choice and Gay Lea have lactose-free sour creams. This recipe also uses butter. Unlike other dairy products, you don’t need to use a lactose-free product (because it’s all fat). Just make sure your butter doesn’t have any “milk solids” and you’re good to go. We’ll also be using chives. According to the Monash app, chives don’t have any detectable FODMAPs, so they won’t add to your FODMAP load. Next up is capers. According to the Monash app, capers in vinegar are safe in servings of 1 tbsp. They don’t have a maximum serving size. This recipe uses 2 tbsp total. This works out to 2 tsp per serving, which is well within the recommended range. This recipe gets a fresh pop of flavour from a splash of fresh lemon juice. 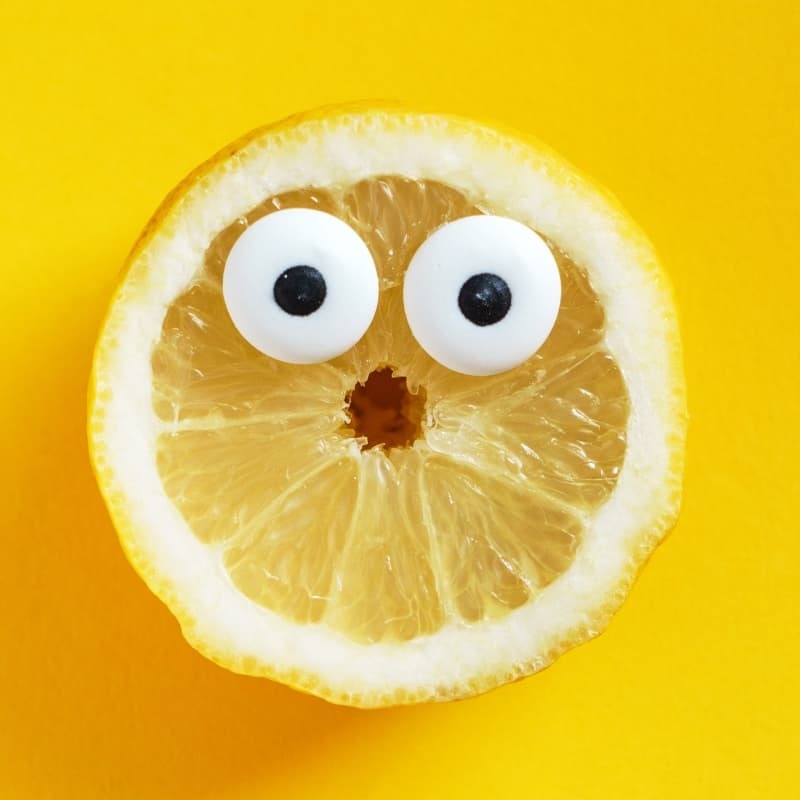 Monash says lemon juice is low FODMAP in servings of 1/2 a cup per sitting. This recipe uses 1.5 tsp total, which is well within the recommended range. Last but not least, is parmesan cheese. According to Monash University, parmesan is low FODMAP in servings of 1/3 of a cup per sitting. Servings of 4 cups or more are high in lactose. This recipe uses 2 tbsp of parmesan total, which is well within the recommended range. If you’re looking for some company for these lemon-caper potato bites on your appetizer table, you can try paring them with my low FODMAP blistered Caprese bites, these savoury low FODMAP mushroom crostini, or even these low FODMAP garlic shrimp! 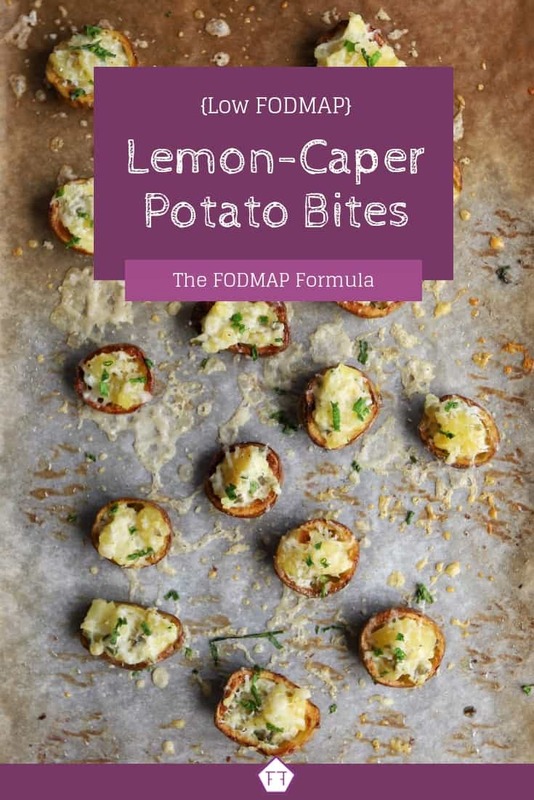 Want to try these low FODMAP lemon-caper potato bites? Don’t forget to PIN THIS RECIPE for later! Looking for an easy low FODMAP appetizer idea? These low FODMAP lemon-caper potato bites are the perfect party finger food! Preheat your oven to 450 degrees and line a baking sheet with parchment paper. Place your potatoes and olive oil in a bowl and give it a shake to coat your potatoes. Preheat your broiler to high. Combine your sour cream, chives, butter, capers, lemon juice, salt, and pepper in a bowl. Once your potatoes have cooled, gently cut a circle in the cut side of each potato and scoop the pulp into the bowl with your other ingredients. Once you've emptied each of your potatoes, stir all of your ingredients together, then spoon them gently back into the potato skins. Sprinkle with parmesan and any leftover chives and broil for 2 minutes. 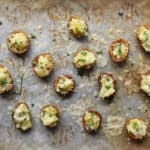 These low FODMAP lemon-caper potato bites are the perfect FODMAP-friendly finger food for your next holiday bash. Did you like this recipe? Don’t forget to share it! Together we’ll get the Low FODMAP Diet down to a science! Low FODMAP Rosemary Potatoes These low FODMAP rosemary potatoes are the perfect hands-off side dish! Whether you’re planning a quiet family dinner or a huge holiday party, they’re sure to please. Low FODMAP Mini Paprika Potatoes These potatoes may be tiny, but they pack a huge flavour punch! Shake yourself out of that potato rut with the bold smokey flavour of these mini paprika potatoes! Low FODMAP Twice Baked Potatoes Looking for a side dish that will rock your socks? You’re going to love these low FODMAP twice baked potatoes. Stuffed with savory bacon bits, cheddar cheese, and FODMAP friendly chives, these twice baked potatoes are the perfect sidekick for any meat and potatoes dish.